Move vehicles. Not only do you need to make space for them to get their trucks and equipment close to your home, but you don’t want to leave your vehicles in harm’s way from any falling debris. Secure pets. Even if you have the most loveable, docile pets in the neighbourhood, it might surprise you what can happen when they face several strangers on their property. For the workers’ safety as well as your pets, plan to keep them in a safe location. Check out the attic. All that pounding on your roof can cause dust and debris to fall inside your home’s attic. If you have personal items you want to protect, be sure to cover them or bring them down from the attic. Check ceiling lights. Most ceiling lights are installed securely and won’t suffer any ill effects, but you should check each of them as action on the roof can jar a loose connection and result in a fixture falling. Check wall decorations. The vibrations during your roofing replacement can also jar loose wall decorations. Take down any that are not secured with screws to prevent them from falling off the wall. Remove equipment on the roof. If you have an antenna or satellite dish on the roof, those will need to be removed prior to the roofer’s arrival. Discuss this with them ahead of time as some are willing to do this for you. Check perimeter. Walk around your home to determine if there is anything within several feet of your home that could be damaged by debris or would be in the way. Potential things to address are patio furniture, grills, and low hanging tree branches. 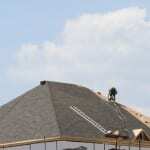 If you would like more tips about preparing for your roofing replacement in Barrie, Ontario, give us a call at Slippery Slope Roofing. We will go above and beyond to make sure your experience is a pleasant one.